On May 30th 2001 the NZ government announced the transfer of all West Coast indigenous forests currently managed by Timberlands West Coast to conservation lands to be managed by the Department of Conservation. This is a great day for the forests and a wonderful victory for non-violent direct action. It’s the result of decades of campaigning and strong public support for the protection of our remaining lowland forests. Government is however allowing rimu logging to continue in Okarito and other South Westland forests until April 2002 so we will not be holding our celebration until all the logging has been stopped. Click here and here for government media releases. Update October 18, 2000 - The Buller Overcut has ended! 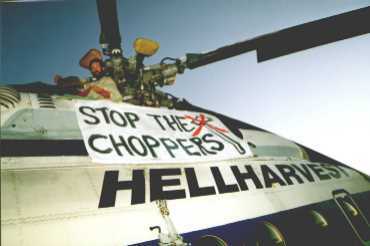 On 15 May 2000 the government announced it is going to stop the logging of all publicly owned native forests by the end of March 2002. While we wish they had stopped all the logging immediately, this is still a mighty big win for conservation... Click Here to Read More Click here to read Wildlife values & wildlife conservation in South Westland. Secrets and Lies: The Anatomy of an Anti-Environmental PR Campaign. Eight NFA activists were found not-guilty of intimidation charges resulting from a logging road blockade earlier in the year. Five other people charged with trespass were fund guilty but discharged without conviction. The peaceful nature of the protests was noted by the judge and the right of all New Zealanders to legitimate protest was upheld. Click here to read more. Unbelievable photos of rimu skid-site in Charleston Forest taken on a recent reconnaissance mission into the logging area. Even though there were 10,298 public submissions opposing the government's beech management plans and only 2,038 in support, their decision has been to approve the plans! Click here to read the analysis. Timberlands Bird & Bat survey leaked to NFA - Click Here to read it. Bought any furniture lately? Something in rimu perhaps? Did they tell you the wood was "recycled", or had been logged using "sustainable" techniques? We've got some bad news. - NFA activists appeared in Court - Tuesday, 21 March click here for photos and details. Things have changed! 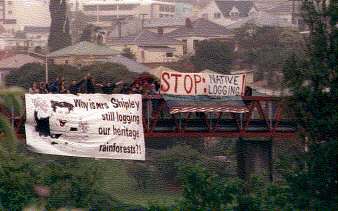 Since the election in November 1999 when the Labour/Alliance coalition took over government there has been significant changes in the native logging situation. The Labour party policy before the election was to stop native logging on public land but to honour any native timber supply contracts signed before the policy announcement. Of course Timberlands immediately piped up and gleefully announced that they had just secured 7 years worth of rimu supply contracts. The Labour party were obliged to concede that these contracts would have to be honoured. Timberlands then announced that they also had eight years worth of beech supply contracts! These turned out to be a sham because they were signed before the resource consents were given. They were thrown out. 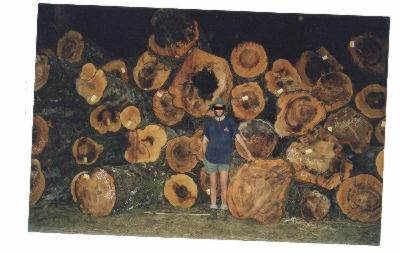 The beech scheme was axed and the Labour party's first act of parliament was to change Timberlands' statement of corporate intent to not include any beech logging. This is a significant victory! and needless to say, Native Forest Action will be watching very closely to make sure there is no evidence of continued beech logging. 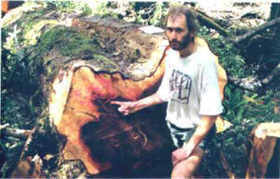 Peter Russell next to the first giant rimu felled this millennium by Timberlands in Orikaka forest. The next development was that the Green party came forward with evidence that the rimu supply contracts were also contestable. They have shown that within the contracts there is a clause that says the contracts are not enforceable if there is a change in government, and furthermore, there is evidence that the contracts were not signed in August 1999 as Timberlands claim but in fact were signed in September only days before the policy announcement! There is no reason why the government can't put an end to the rimu logging as well. At this stage rimu logging in the Buller overcut continues apace. Native Forest Action will be pushing for an end to this ASAP! You can help by writing to the Labour party. Helen Clark, Pete Hodgson, and Marion Hobbs are the people to speak to. Timberlands is to be 'wound up' and its assets placed in a Trust under West Coast control as part of the regional development package given tot he West Coast region as compensation for the end of native logging. Both activists were found guilty and discharged without conviction. Most New Zealanders cannot believe that our native forest are being logged. But sadly they are. A small state-owned-enterprise called Timberlands West Coast is being allowed to plunder priceless rimu and beech forests all over the West Coast of New Zealand's South Island. Timberlands is currently pushing more logging roads through Okarito forest. Native Forest Action is committed to halting this outrageous destruction primarily by campaigning to stop logging of publicly-owned native forests by the SOE Timberlands West Coast Ltd since 1995 (including the "overcut" in the Buller, the massive proposed beech scheme, and the so-called "sustainable" logging of the Saltwater and Okarito rimu forests). This website is intended to enable the sharing of information, to create interest and awareness, and to gain support for the fight against native logging. There are NFA groups in many cities around NZ. If you want to join NFA, or give us a hand, or just get more information, you are welcome to contact your nearest NFA group. The forests at stake are very worth saving. They include the tall rimu forests on the shore of Okarito Lagoon, magnificent natural Beech forests that are home to many endangered birds in north Westland and the rich forests near the northern end of Paparoa National Park. Timberlands pays the crown only $10-$15 on average for each centuries-old tree it logs. It then sells them to the sawmill for $400-$1500 (depending on the quality). That is why Timberlands doesn't want to stop. It is receiving a massive subsidy from the state through undervaluing the forests. These profits fund exorbitant salaries (the CEO, with under 50 staff, is paid the same as the Prime minister! ), an unlimited PR budget and uncontrolled overheads. In seven years the SOE has not paid a cent of dividend to the state. 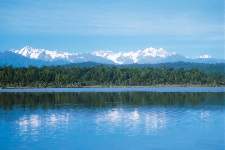 Apart from priceless ecological value, the unique forests of the West Coast (temperate rainforests) are worth far more to New Zealand through tourism than as timber. The clean green image that New Zealand is so fond of, and that is so valuable to us, is fallacious in light of our continued destruction of our own native forests. But isn't the logging done in a sustainable way? Only if you believe Timberlands propaganda!! The concept of sustainable, in terms of a forest's well-being, refers to ecological sustainability - the extent to which the forest will retain its ecological integrity and biodiversity. Timberlands have neatly redefined the term to refer to economic sustainability - the extent to which they can log the forest without destroying its potential to be logged in the future. It is a fraud. Felling and removing 10 000's of centuries old forest giants dramatically alters the ecology of the area. In terms of plant and birdlife the effects are far-reaching and non-reversible. Planting a rimu seedling in place of a 700 year old tree is ... well, pathetic? Furthermore, what Timberlands tries to hide is that the SOE is shortly going to be privatised. From that day, the private manager of our public native forests would be allowed (under the Forests Act) to clearfell football filed sized areas throughout the beech forests, up to one thousand hectares each year. Our precious natural rainforests would progressively become private plantations - a natural heritage lost forever. They also claim that they will spend money to help protect wildlife from introduced predators to compensate for the effects of logging these birds' and animals' forests. This is as crazy as a government offering to allocate extra money for fisheries research to compensate for legalising drift-net fishing. Money is needed to protect wildlife, but it is no justification for wrecking the wildlife's habitat. Get Your Free Anti-Logging Poster Here! Nick Young, National Co-ordinator, Native Forest Action, P O Box 836, Nelson.